epa06873710 Resident volunteers are searching for missing people in flooded Kurashiki, Okayama Prefecture, western Japan, 08 July 2018. 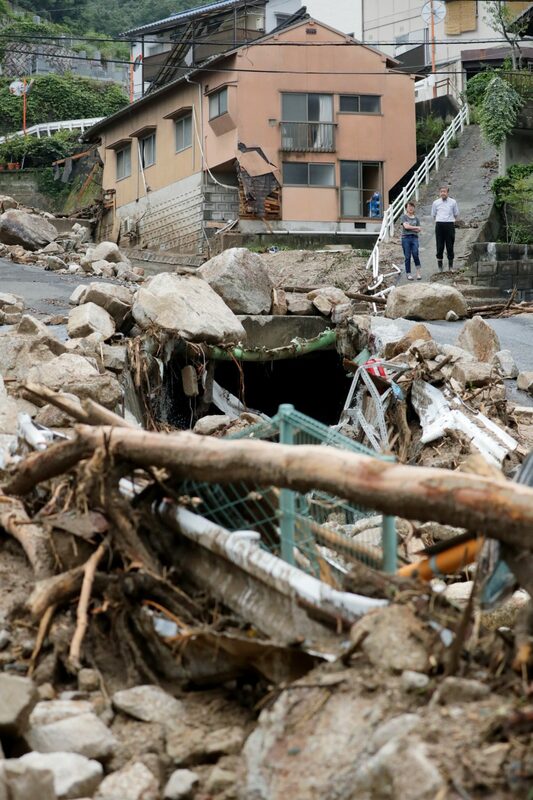 Heavy rainfall killed 81 people and missing 58 people at least in southwestern and western Japan, public television reported on 08 July 2018. Japan Meteorological Agency has warned record rainfall on 06 July for flooding, mudslides in southwestern and western Japan through 08 July and issued emergency weather warnings to six prefectures. In nine prefectures in western and southwestern Japan, authorities issued evacuation orders to more than for million of people in southwestern and western Japan. EPA/JIJI PRESS JAPAN OUT EDITORIAL USE ONLY/NO SALES Dostawca: PAP/EPA. Bilans ofiar śmiertelnych ulewnych deszczy, jakie od kilku dni trapią południową i zachodnią część Japonii wzrósł do co najmniej 82 osób, ponad 50 osób uznaje się za zaginione. Liczba ofiar śmiertelnych może jeszcze wzrosnąć. Szacunki są prowizoryczne. Wciąż trwa akcja ratunkowa i niestety odkrywane są nowe ofiary.Trwa wielka operacja poszukiwawczo-ratunkowa. Najbardziej dotknięte są prefektury Ehime, Hiroszima, Kioto, Kochi, Gifu i Okayama, gdzie doszło do licznych osunięć ziemi, lawin błotnych i powodzi. W ocenie premiera Shinzo Abe „sytuacja jest wyjątkowo poważna”. Szef gabinetu zarządził wykorzystanie wszelkich możliwych środków dla niesienia pomocy zagrożonym. Rząd utworzył biuro kontaktowe w ośrodku zarządzania kryzysowego w kancelarii premiera. Na sobotnim posiedzeniu rządu Abe nakazał „priorytetowe traktowanie ratowania życia ludzkiego oraz bezzwłoczne wysyłanie zespołów ratunkowych”. „Wciąż wiele osób jest zaginionych, inne potrzebują natychmiastowej pomocy. To jest wyścig z czasem” – powiedział premier w swym wystąpieniu telewizyjnym. Z obszarów objętych ulewami ewakuowano już łącznie 2 mln osób. W akcjach ratowniczych uczestniczy 64 tys. strażaków oraz żołnierzy sił samoobrony terytorialnej. Ich głównym zadaniem jest ratowanie ludzi, którzy schronili się na dachach swych domów na terenach zalanych wodą. W sobotę japońska Agencja Meteorologiczna wydała specjalne ostrzeżenia pogodowe dla trzech prefektur na wyspie Honsiu – jednej z czterech głównych wysp – i zaapelowała o zachowanie ostrożności wobec możliwych osunięć ziemi, przybierających rzek i silnych wiatrów. Zalecono ewakuację 2,3 mln ludzi. Do poniedziałku ma tam spaść 300 mm opadów. Kyodo podkreśla, że są to ostrzeżenia, jakie wydaje się, jeśli meteorolodzy przypuszczają, iż powodzie i osunięcia ziemi mogą być szczególnie groźne, tak bardzo, jak zdarza się to raz lub dwa razy na 50 lat. W najbardziej dotkniętych ulewami miejscach poziom wody sięgnął 5 metrów. Ulewne deszcze zniszczyły infrastrukturę transportową, co dodatkowo utrudnia prowadzenia akcji ratowniczej. Żywioł nie oszczędził także przemysłu. Według agencji Kyodo kilku producentów samochodów wstrzymało produkcję, gdyż deszcze i powodzie przerwały drogi zaopatrzenia, a także zagroziły bezpieczeństwu pracowników. Działania wstrzymała w jednym z zakładów korporacja Mitsubishi Motors, gdyż nie można było otrzymać części. Informuje też, że Mazda Motor zatrzymała linie produkcyjne w dwóch fabrykach, by nie narażać pracowników na dojazdy w niebezpiecznych warunkach pogodowych. epa06873714 Flood by heavy rain damage a residential district in Hiroshima, Hiroshima Prefecture, western Japan, 08 July 2018. Heavy rainfall killed 81 people and missing 58 people at least in southwestern and western Japan, public television reported on 08 July 2018. 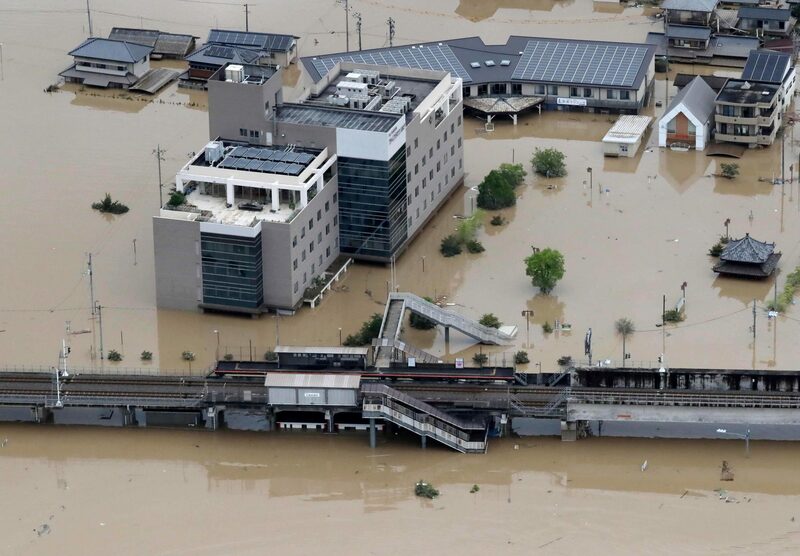 Japan Meteorological Agency has warned record rainfall on 06 July for flooding, mudslides in southwestern and western Japan through 08 July and issued emergency weather warnings to six prefectures. 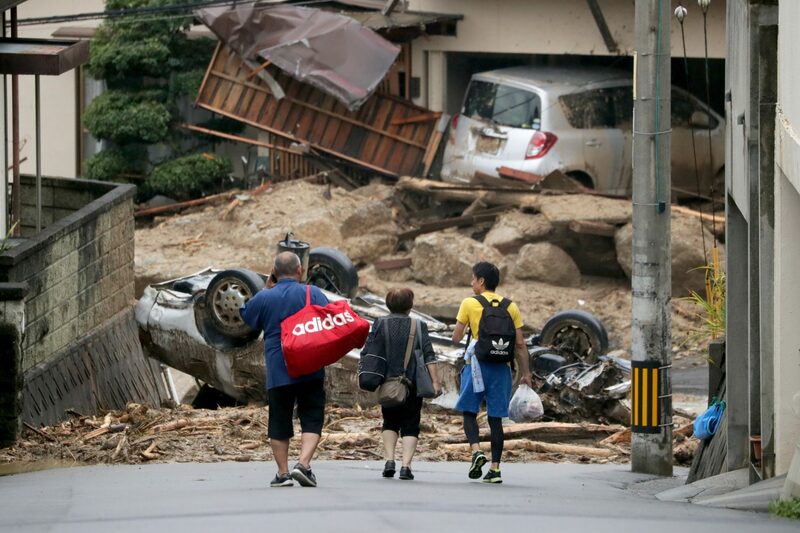 In nine prefectures in western and southwestern Japan, authorities issued evacuation orders to more than for million of people in southwestern and western Japan. EPA/JIJI PRESS JAPAN OUT EDITORIAL USE ONLY/NO SALES Dostawca: PAP/EPA. 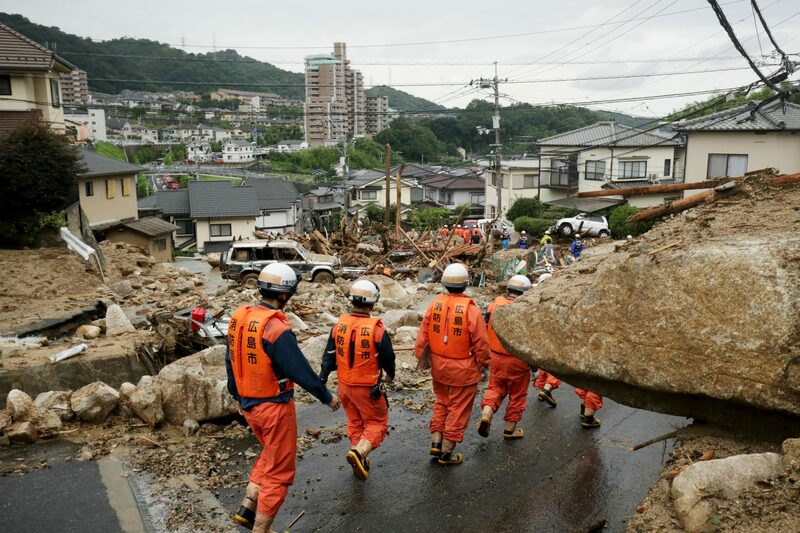 epa06873713 Hiroshima fire department rescue workers are searching missing people at landslide-devastated residential area in Hiroshima, Hiroshima Prefecture, western Japan, 08 July 2018. Heavy rainfall killed 81 people and missing 58 people at least in southwestern and western Japan, public television reported on 08 July 2018. Japan Meteorological Agency has warned record rainfall on 06 July for flooding, mudslides in southwestern and western Japan through 08 July and issued emergency weather warnings to six prefectures. In nine prefectures in western and southwestern Japan, authorities issued evacuation orders to more than for million of people in southwestern and western Japan. EPA/JIJI PRESS JAPAN OUT EDITORIAL USE ONLY/NO SALES Dostawca: PAP/EPA. epa06873712 Residents start to clear their house flooded by heavy rain in Kurashiki, Okayama Prefecture, western Japan, 08 July 2018. Heavy rainfall killed 81 people and missing 58 people at least in southwestern and western Japan, public television reported on 08 July 2018. 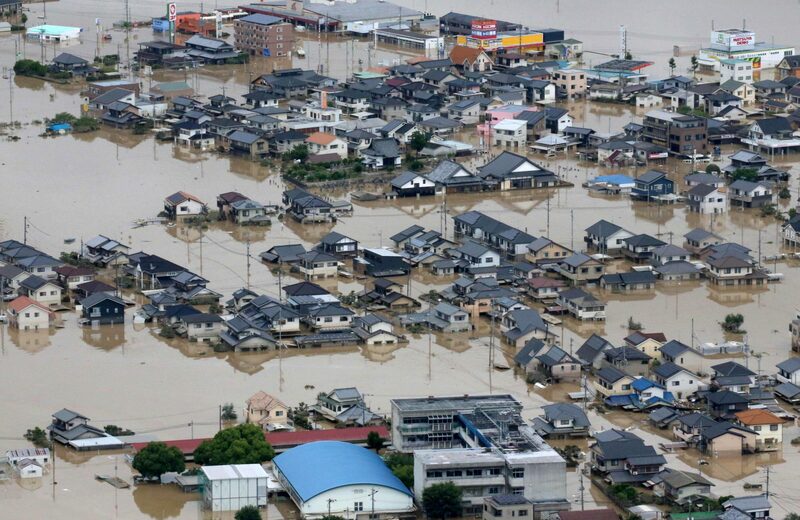 Japan Meteorological Agency has warned record rainfall on 06 July for flooding, mudslides in southwestern and western Japan through 08 July and issued emergency weather warnings to six prefectures. In nine prefectures in western and southwestern Japan, authorities issued evacuation orders to more than for million of people in southwestern and western Japan. EPA/JIJI PRESS JAPAN OUT EDITORIAL USE ONLY/NO SALES Dostawca: PAP/EPA. epa06873709 Flood by heavy rain damage a residential district in Hiroshima, Hiroshima Prefecture, western Japan, 08 July 2018. Heavy rainfall killed 81 people and missing 58 people at least in southwestern and western Japan, public television reported on 08 July 2018. Japan Meteorological Agency has warned record rainfall on 06 July for flooding, mudslides in southwestern and western Japan through 08 July and issued emergency weather warnings to six prefectures. In nine prefectures in western and southwestern Japan, authorities issued evacuation orders to more than for million of people in southwestern and western Japan. EPA/JIJI PRESS JAPAN OUT EDITORIAL USE ONLY/NO SALES Dostawca: PAP/EPA. epa06873181 An aerial view of a flooded railway station in Kurashiki, Okayama Prefecture, western Japan, 08 July 2018. Heavy rainfall killed 65 people and missing more than 45 people in southwestern and western Japan, public television reported on 08 July 2018. Japan Meteorological Agency has warned record rainfall on 06 July for flooding, mudslides in southwestern and western Japan through 08 July and issued emergency weather warnings to six prefectures. In nine prefectures in western and southwestern Japan, authorities issued evacuation orders to more than one million people as Typhoon Maria passes the area. EPA/JIJI PRESS JAPAN OUT EDITORIAL USE ONLY NO ARCHIVES Dostawca: PAP/EPA. 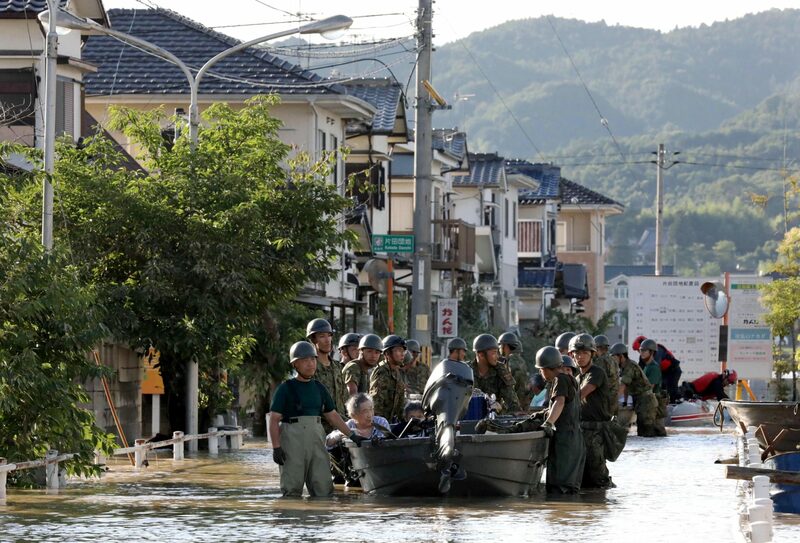 epa06873529 Japan’s Ground Self-Defense Force’s personnels rescue inpatients, hospital staff and residents evacuating to Mabi Memorial Hospital in Kurashiki, Okayama Prefecture, western Japan, 08 July 2018. Heavy rainfall killed 75 people and missing more than 60 people in southwestern and western Japan, public television reported on 08 July 2018. Japan Meteorological Agency has warned record rainfall on 06 July for flooding, mudslides in southwestern and western Japan through 08 July and issued emergency weather warnings to six prefectures. In nine prefectures in western and southwestern Japan, authorities issued evacuation orders to more than for million of people in southwestern and western Japan. EPA/JIJI PRESS JAPAN OUT EDITORIAL USE ONLY/NO SALES/NO ARCHIVES Dostawca: PAP/EPA. 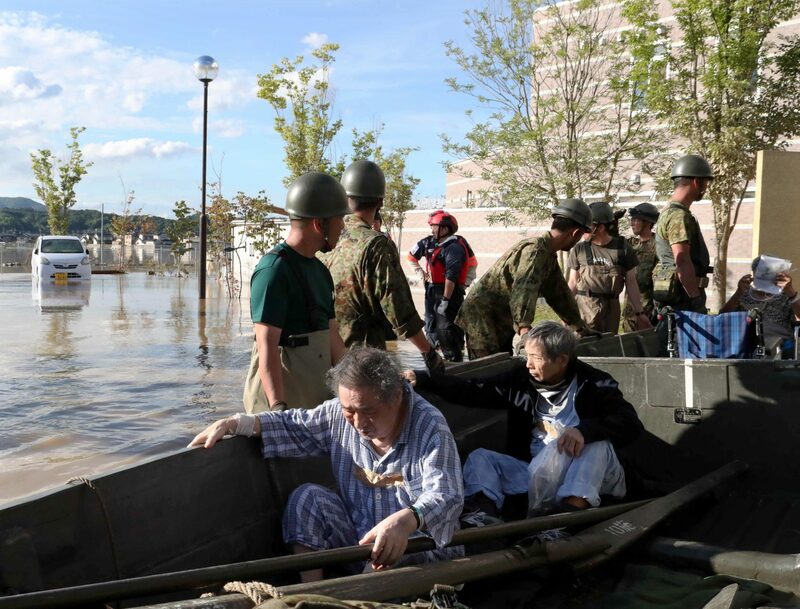 epa06873530 Japan’s Ground Self-Defense Force’s personnels rescue inpatients, hospital staff and residents evacuating to Mabi Memorial Hospital in Kurashiki, Okayama Prefecture, western Japan, 08 July 2018. Heavy rainfall killed 75 people and missing more than 60 people in southwestern and western Japan, public television reported on 08 July 2018. Japan Meteorological Agency has warned record rainfall on 06 July for flooding, mudslides in southwestern and western Japan through 08 July and issued emergency weather warnings to six prefectures. 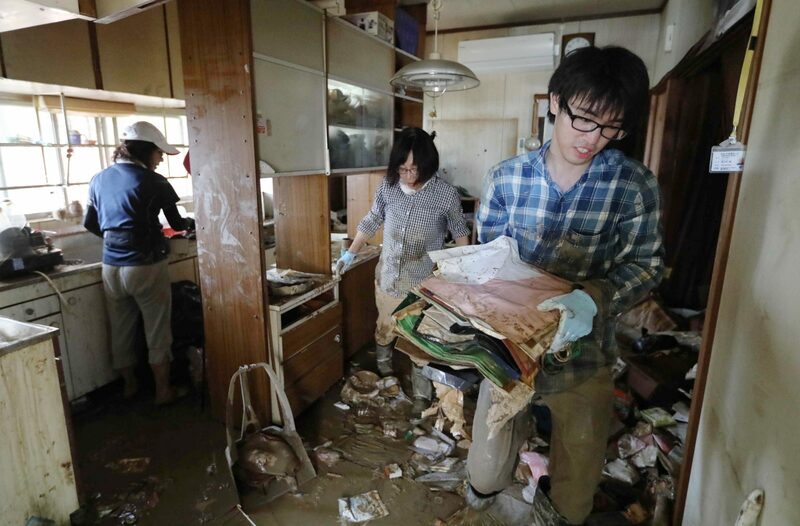 In nine prefectures in western and southwestern Japan, authorities issued evacuation orders to more than for million of people in southwestern and western Japan. EPA/JIJI PRESS JAPAN OUT EDITORIAL USE ONLY/NO SALES/NO ARCHIVES Dostawca: PAP/EPA. epa06873531 Residents take their dogs from flooded area in Kurashiki, Okayama Prefecture, western Japan, 08 July 2018. Heavy rainfall killed 75 people and missing more than 60 people in southwestern and western Japan, public television reported on 08 July 2018. Japan Meteorological Agency has warned record rainfall on 06 July for flooding, mudslides in southwestern and western Japan through 08 July and issued emergency weather warnings to six prefectures. 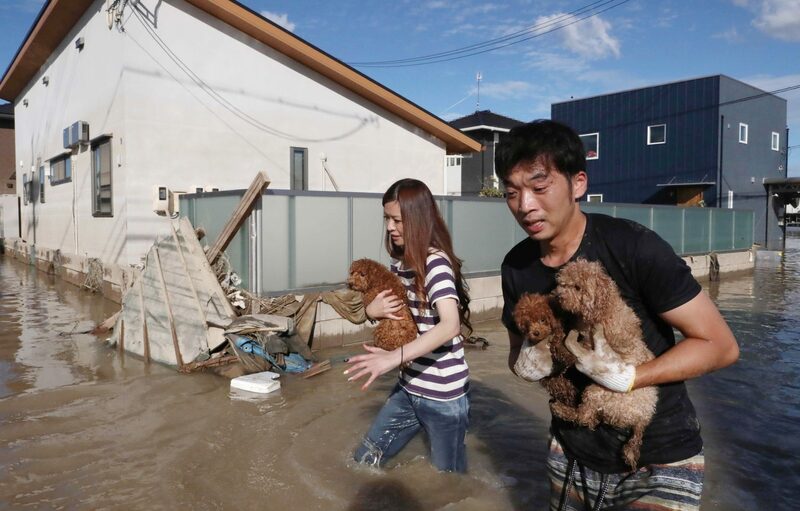 In nine prefectures in western and southwestern Japan, authorities issued evacuation orders to more than for million of people in southwestern and western Japan. EPA/JIJI PRESS JAPAN OUT EDITORIAL USE ONLY/NO SALES/NO ARCHIVES Dostawca: PAP/EPA. 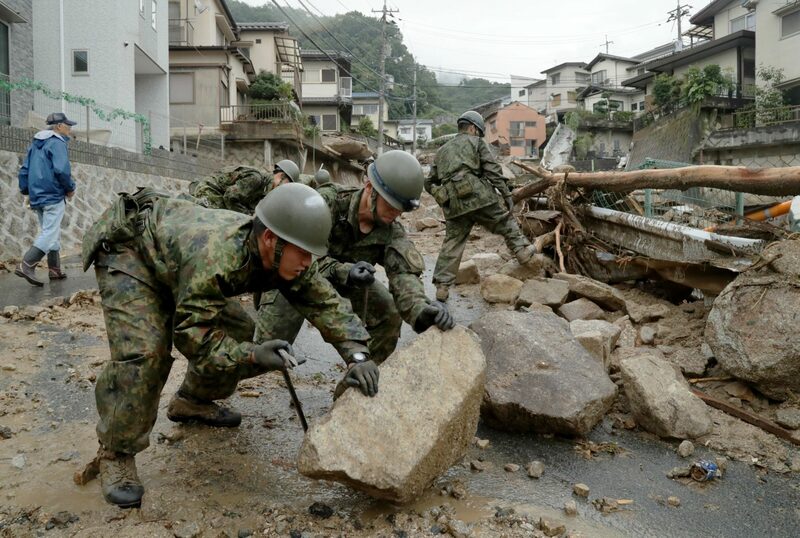 epa06873532 Japan’s Ground Self-Defense Force’s personnels remove rocks to make way in Hiroshima, Hiroshima Prefecture, western Japan, 08 July 2018. Heavy rainfall killed 75 people and missing more than 60 people in southwestern and western Japan, public television reported on 08 July 2018. Japan Meteorological Agency has warned record rainfall on 06 July for flooding, mudslides in southwestern and western Japan through 08 July and issued emergency weather warnings to six prefectures. In nine prefectures in western and southwestern Japan, authorities issued evacuation orders to more than for million of people in southwestern and western Japan. EPA/JIJI PRESS JAPAN OUT EDITORIAL USE ONLY/NO SALES/NO ARCHIVES Dostawca: PAP/EPA. epa06873533 Residents walk on a road damaged by flood in Hiroshima, Hiroshima Prefecture, western Japan, 08 July 2018. Heavy rainfall killed 75 people and missing more than 60 people in southwestern and western Japan, public television reported on 08 July 2018. Japan Meteorological Agency has warned record rainfall on 06 July for flooding, mudslides in southwestern and western Japan through 08 July and issued emergency weather warnings to six prefectures. In nine prefectures in western and southwestern Japan, authorities issued evacuation orders to more than for million of people in southwestern and western Japan. EPA/JIJI PRESS JAPAN OUT EDITORIAL USE ONLY/NO SALES/NO ARCHIVES Dostawca: PAP/EPA. epa06873180 An aerial view of the flooded Takahashi River in Kurashiki, Okayama Prefecture, western Japan, 08 July 2018. 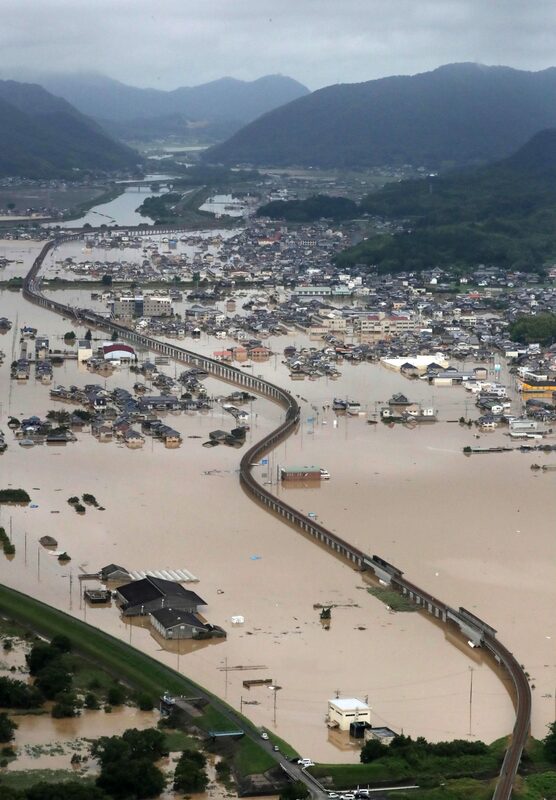 Heavy rainfall killed 65 people and missing more than 45 people in southwestern and western Japan, public television reported on 08 July 2018. Japan Meteorological Agency has warned record rainfall on 06 July for flooding, mudslides in southwestern and western Japan through 08 July and issued emergency weather warnings to six prefectures. In nine prefectures in western and southwestern Japan, authorities issued evacuation orders to more than one million people as Typhoon Maria passes the area. EPA/JIJI PRESS JAPAN OUT EDITORIAL USE ONLY NO ARCHIVES Dostawca: PAP/EPA. epa06873179 An aerial view of the flood in Kurashiki city, Okayama Prefecture, western Japan, 08 July 2018. 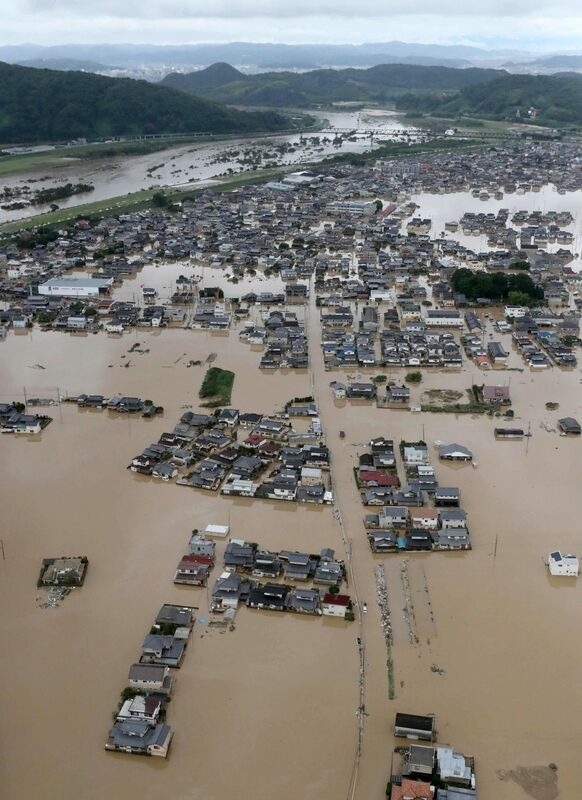 Heavy rainfall killed 65 people and missing more than 45 people in southwestern and western Japan, public television reported on 08 July 2018. Japan Meteorological Agency has warned record rainfall on 06 July for flooding, mudslides in southwestern and western Japan through 08 July and issued emergency weather warnings to six prefectures. In nine prefectures in western and southwestern Japan, authorities issued evacuation orders to more than one million people as Typhoon Maria passes the area. EPA/JIJI PRESS JAPAN OUT EDITORIAL USE ONLY NO ARCHIVES Dostawca: PAP/EPA. epa06873178 An aerial view of the flood in Kurashiki city, Okayama Prefecture, western Japan, 08 July 2018. 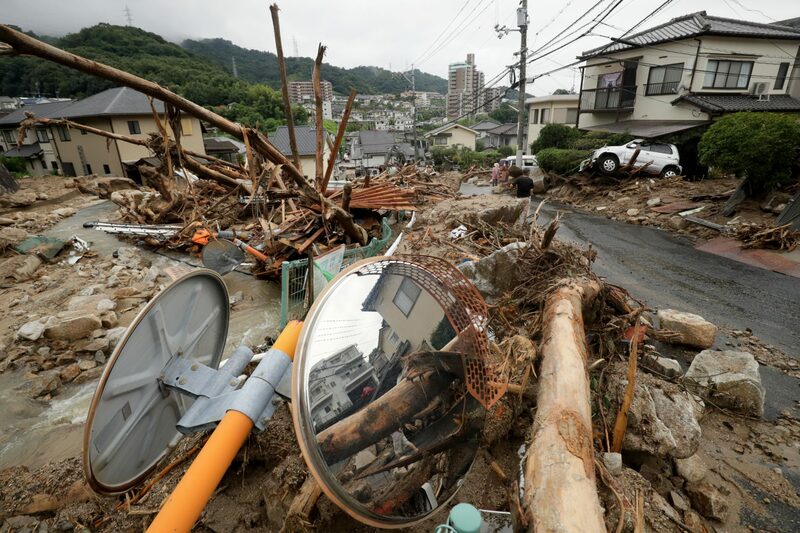 Heavy rainfall killed 65 people and missing more than 45 people in southwestern and western Japan, public television reported on 08 July 2018. Japan Meteorological Agency has warned record rainfall on 06 July for flooding, mudslides in southwestern and western Japan through 08 July and issued emergency weather warnings to six prefectures. In nine prefectures in western and southwestern Japan, authorities issued evacuation orders to more than one million people as Typhoon Maria passes the area. EPA/JIJI PRESS JAPAN OUT EDITORIAL USE ONLY NO ARCHIVES Dostawca: PAP/EPA. 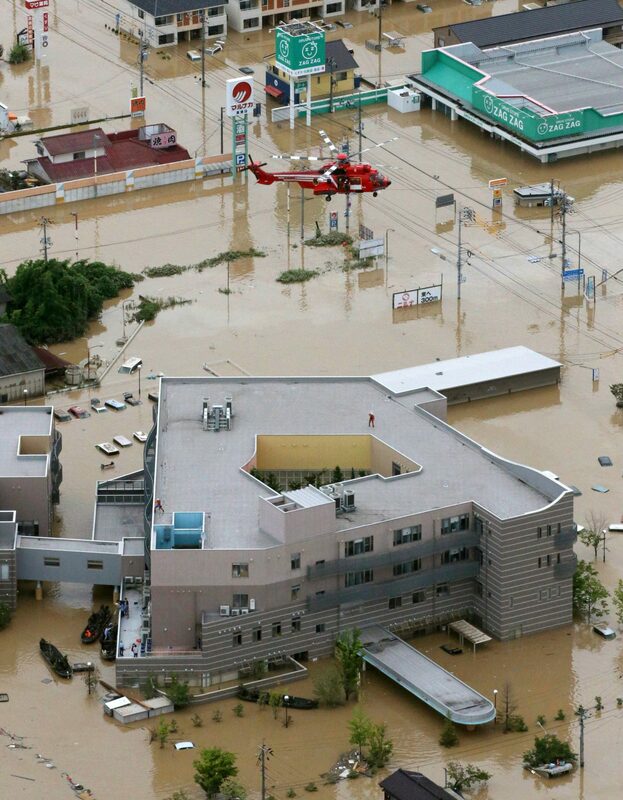 epa06873176 An aerial view of a rescue helicopter hovering over Mabi Memorial Hospital to rescue inpatients, hospital staff and residents in Kurashiki, Okayama Prefecture, western Japan, 08 July 2018. Heavy rainfall killed 65 people and missing more than 45 people in southwestern and western Japan, public television reported on 08 July 2018. Japan Meteorological Agency has warned record rainfall on 06 July for flooding, mudslides in southwestern and western Japan through 08 July and issued emergency weather warnings to six prefectures. In nine prefectures in western and southwestern Japan, authorities issued evacuation orders to more than one million people as Typhoon Maria passes the area. EPA/JIJI PRESS JAPAN OUT EDITORIAL USE ONLY NO ARCHIVES Dostawca: PAP/EPA. epa06873173 An aerial view of the flood in Kurashiki city, Okayama Prefecture, western Japan, 08 July 2018. Heavy rainfall killed 65 people and missing more than 45 people in southwestern and western Japan, public television reported on 08 July 2018. 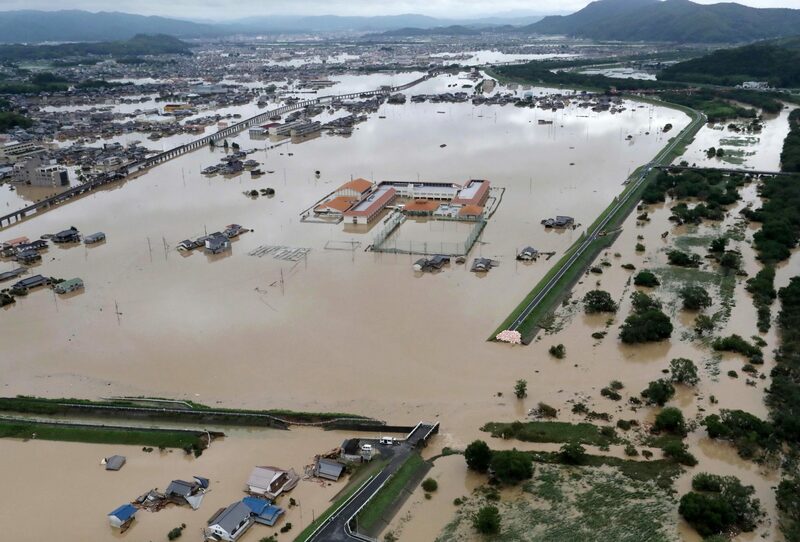 Japan Meteorological Agency has warned record rainfall on 06 July for flooding, mudslides in southwestern and western Japan through 08 July and issued emergency weather warnings to six prefectures. In nine prefectures in western and southwestern Japan, authorities issued evacuation orders to more than one million people as Typhoon Maria passes the area. EPA/JIJI PRESS JAPAN OUT EDITORIAL USE ONLY NO ARCHIVES Dostawca: PAP/EPA.